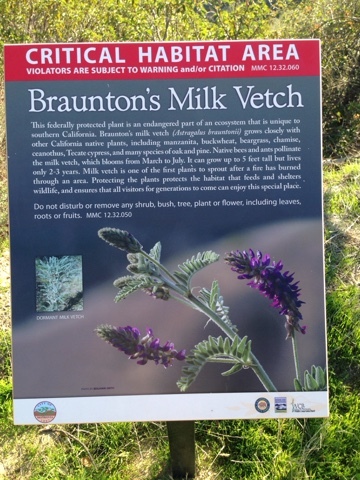 - Donovan added that the Clamshell road used to be scraped yearly by the county, for free, but now, with the discovery of the endangered-ness of the milk vetch, not so often because you need permission from the Department of Fish and Game. Comment: Um, so we're not going to scrape the road - which makes the milk vetch flourish - because we want to protect the milk vetch? - Councilmember Gloria Crudgington said hikers' boots and bicyclists' tires are responsible for introducing invasive species into the hills. - The Council was concerned that the bond money for maintenance will run out in 13 years and advocated a more minimalist cost-saving maintenance approach than city staff proposed. Mayor Tom Adams said, "I don't know that we need a lot of people [employees] to leave nature alone." Wow, look at what we voted into power in Monrovia. How disappointing to hear these ignorant statements. The future for the Wilderness Preserve looks bleak.